Lenovo gives students reason to look forward to the school year with Lenovo Back-to-School bundles and the Lenovo G40-30 cashback promotion. 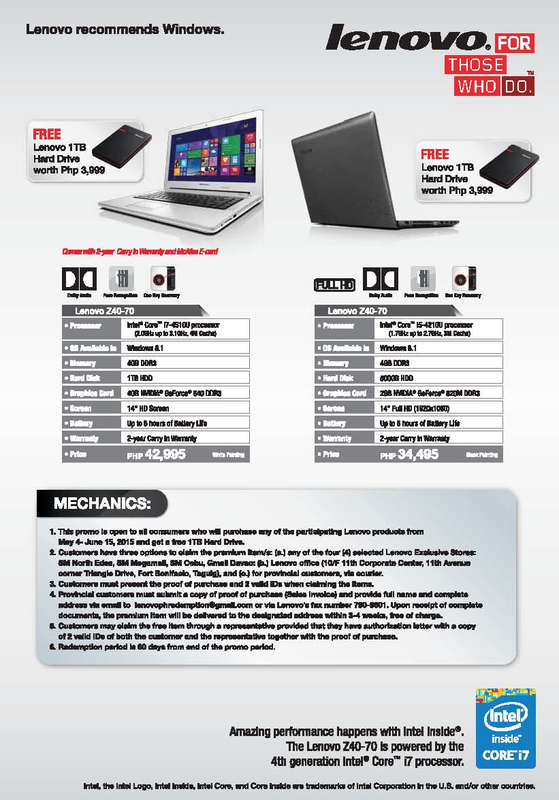 Students who purchase select Lenovo PCs until June 15, 2015 will receive a free Lenovo 1TB Hard Drive worth Php3,999 and even have a chance to get their money back, when they purchase the Lenovo G40-30 until June 30, 2015. “With high processing power, speed, and memory, Lenovo PCs like the dual-mode Lenovo Flex 2, support millennial students’ dynamic needs, so they can thrive competitively in a hectic school environment. To attack the vibrant student market, we are holding a Back-to-School promotion to give students more bang for their buck when they purchase select Lenovo desktop PCs in time for the new academic year,” said Michael Ngan, Country General Manager, Lenovo Philippines. Lenovo Flex 2 offers two unique modes in a portable form factor, so the dynamic multi-tasker can easily work, study, and play anywhere, anytime. It works great in its traditional clamshell laptop mode for productivity tasks like creating videos, checking for school announcements, and sending files to groupmates. By flipping the keyboard underneath the screen by 300 degrees, students can also convert the Lenovo Flex 2 into a Stand. Utilizing its HD 1920x1080 widescreen display in upright position, sudents can conduct video concalls with groupmates to discuss project work or to just enjoy movies whenever they wish to take a break. The Lenovo Flex 2 also has a comfortable keyboard that features a stylish and functional one-piece multitouch touchpad and an optional cool metal palmrest, for an enhanced typing and touchscreen experience. The 14” Lenovo Z40-70 and 15” Lenovo Z50-70 feature up to Intel i7 processors, 500 GB memory, and a battery life that can last up to 5 hours, to ensure that students have all the speed, power, and memory requirements to thrive in their day-to-day computing tasks. Equip with high-definition screens, students can also view digital content better, especially when they are reviewing reports or reading e-books for their classes. Featuring Dolby technology, the Lenovo Z Series laptops deliver a powerful and immersive mutimedia experience, so students can enjoy and immerse themselves in audio-visual learning. The laptops also feature an integrated 720p HD webcam, for more productive video conferences. The Lenovo G40-30 is all about productivity, with a Quad Core processor that runs up to 2.17 GHz and a 500 GB hard drive storage for all the files accumulated from daily school projects. Its 14” HD LED screen is matched with a HD Webcam, so students can conduct video conferences with their groupmates better. Lenovo G40-30 operates on Windows 8.1 for enhanced efficiency to take on students’ academic workload with ease. Lenovo Flex 2 comes in white and red for the 14-inch model and black for the 15.6-inch model, with SRPs at Php39,995 and Php49,995 respectively. Pricing for Lenovo Z40-70 and Lenovo Z50-70 starts at Php34,495 and Php35,495 respectively. Lenovo G40-30 is available at Php15,495. As part of the Back-to-School promo, which runs until June 15, 2015, the laptops are bundled with a free Lenovo 1TB Hard Drive, so students can have more storage space for their school files. 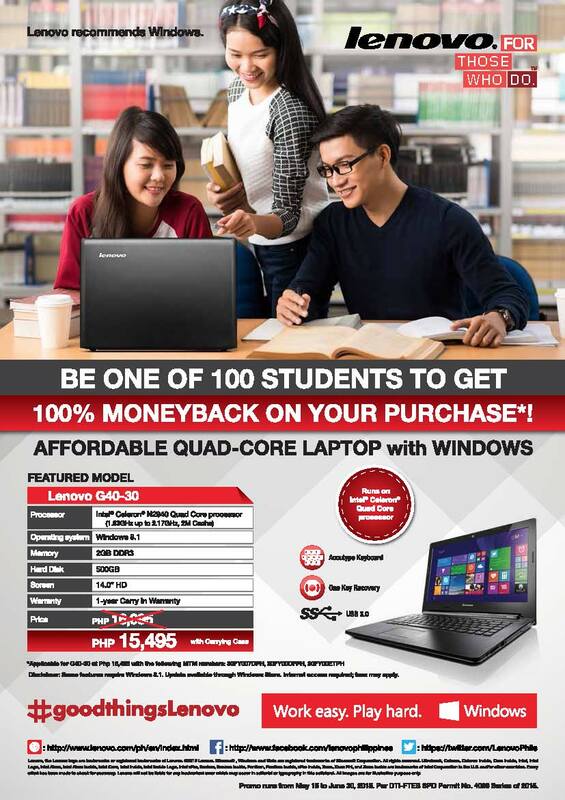 Those who purchase Lenovo G40-30 until June 30, 2015 will also get an opportunity to be one of the 100 students to get their money back at the end of the promo period. 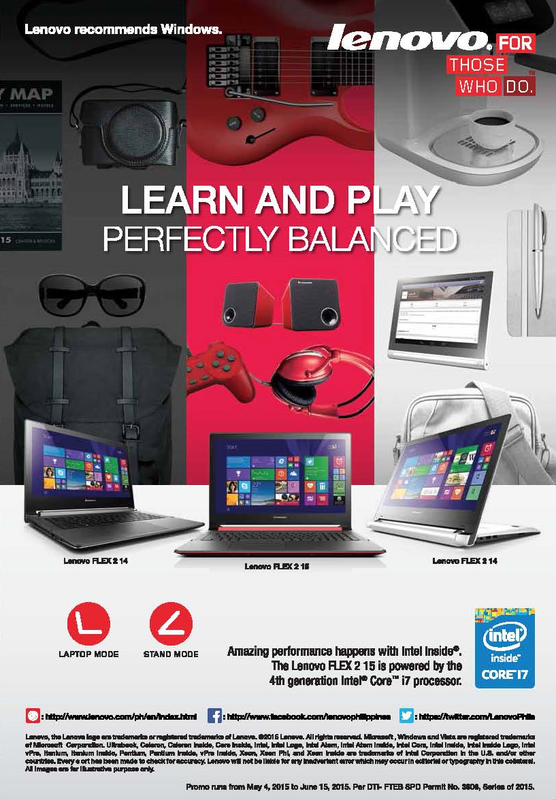 Students can purchase all models through select Lenovo Exclusive Stores (LES) and authorized resellers nationwide.